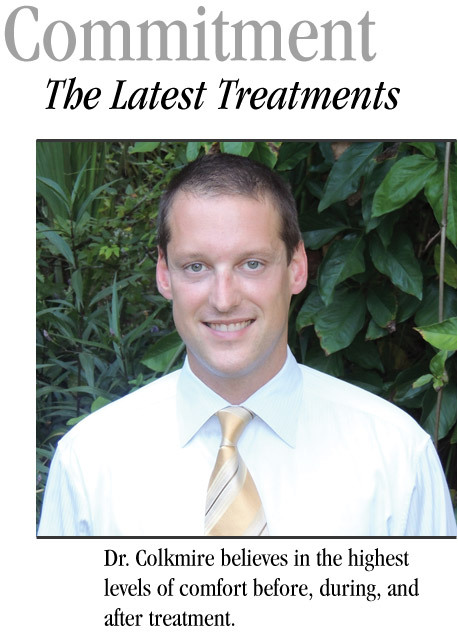 Dr. Joshua Colkmire is pleased to be able to offer beautiful smiles to his neighbors in Sarasota and the surrounding area. Dr. Colkmire earned his dental degree from NYU College of Dentistry, after earning bachelor degrees from Lee University and the University of North Carolina at Chapel Hill. His numerous professional memberships include the American Dental Association, the Florida Dental Association, the American Academy of Cosmetic Dentistry and the Renowned Seattle Study Club. Dr. Colkmire has taken extensive post-graduate education courses, specifically selecting courses focusing on esthetic, restorative, and implant dentistry. Dr. Colkmire’s commitment to lifelong education means that he is constantly evaluating emerging dental methods and technologies in order to provide his patients with the best results in the least invasive manner with a high emphasis on comfort. This commitment ensures you the highest level of care, both today and tomorrow. Away from the office, Dr. Colkmire enjoys spending time with his wife, Laura, and their son, as well as fishing and competing in triathlons. As a classically trained musician, he also enjoys playing a variety of musical instruments.